Wrap your love up in something charming! 9mm x 10mm x 6mm Sterling silver Vintage-style hearts embraced by texture rich Bali silver rope-edge bead caps, in this two-tone version of our "Treasured Hearts" will accomplish the task. 14k gold-filled seamless rounds & Bali silver dotted edge spacers add sparkle & shine. There are no further discounts on this laser engraved item. 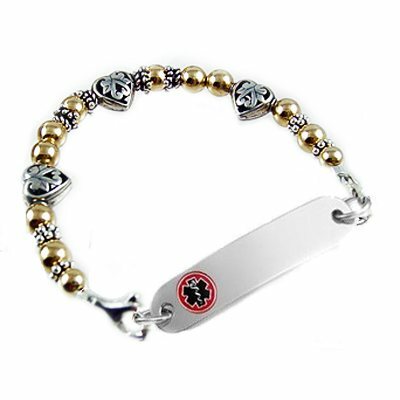 Price includes: One Ladies stainless medical id tag with embossed, enamel filled emblem and dark laser engraving and interchangeable beaded strand, two lobster clasps. *Click images, then make selections below. 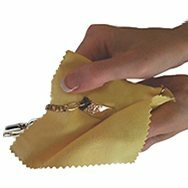 Sizing: Take a snug wrist measurement, (no wiggle room) and add one inch. Wrist Measurement + 1 Inch = Correct Bracelet Size. Add one of these to your order!